A grant of $7,500 was awarded to Genesis Center to support the Bridges to Career Opportunities program, a comprehensive educational and support services program that helps prepare learners for careers in health care or culinary arts while also building basic skills, financial literacy, and computer proficiency. Posted on March 2, 2016 by Shannon Carroll. PROVIDENCE – Citizens Bank and NBC 10 today announced Genesis Center as a 2016 Champion in Action® in the category of strengthening communities through workforce development. Genesis Center will receive $35,000 in unrestricted funding, media coverage, and extensive promotional and volunteer support for its outstanding work. The Genesis Center seeks to provide the highest quality education, job training and support services to people of diverse cultures with an emphasis on economic independence. Their services include job training, English for Speakers of Other Languages (ESOL), a national external diploma program and centers for both financial literary and early education. Through their education and training programs, Genesis served more than 700 adults last year in Rhode Island. Champions in Action is part of Citizens Helping Citizens Strengthen Communities, the bank’s program designed to enhance quality of life and economic vitality in local communities. It provides support for small nonprofit organizations to recognize their contributions to communities throughout Rhode Island. For more information about the Citizens Bank and NBC 10 Champions in Action program, visitwww.citizensbank.com/community/champions. Citizens Financial Group, Inc. is one of the nation’s oldest and largest financial institutions, with $135.4 billion in assets as of September 30, 2015. Headquartered in Providence, Rhode Island, Citizens offers a broad range of retail and commercial banking products and services to individuals, small businesses, middle‐market companies, large corporations and institutions. In Consumer Banking, Citizens helps its retail customers “bank better” with mobile and online banking, a 24/7 customer contact center and the convenience of approximately 3,200 ATMs and approximately 1,200 Citizens Bank branches in 11 states in the New England, Mid‐Atlantic and Midwest regions. Citizens also provides mortgage lending, auto lending, student lending and commercial banking services in select markets nationwide. In Commercial Banking, Citizens offers corporate, institutional and not‐for‐profit clients a full range of wholesale banking products and services including lending and deposits, capital markets, treasury services, foreign exchange and interest hedging, leasing and asset finance, specialty finance and trade finance. Citizens operates through its subsidiaries Citizens Bank, N.A., and Citizens Bank of Pennsylvania. Additional information about Citizens and its full line of products and services can be found at www.citizensbank.com. Posted on January 22, 2016 by Shannon Carroll. Shannon Carroll is president and CEO of the Providence-based Genesis Center. Shannon Carroll is president and CEO of the Providence-based Genesis Center, a post she has held for a little more than a year after serving as vice president of programs and then senior vice president of operations. The nonprofit provides education, job training and support services to immigrants, refugees and low-income families to help them achieve economic independence. Here, Carroll discusses how the nonprofit fulfills its mission. PBN: Of the educational, job training and support services the center offers, which generate the most demand and how are you meeting it? CARROLL: Our primary programs are ESOL (English for Speakers of Other Languages), job training in the fields of health care and culinary arts, early childhood education, citizenship preparation, high school credentialing and wrap-around support services, including case management, job counseling and financial coaching. We have waiting lists for almost all of our programs, but ESOL, with over 200 individuals at any given time, sees the most demand. To address this, we have expanded our evening program, implemented a distance-learning platform, and have been reaching out to local schools to offer onsite ESOL classes to parents of their students. An important aspect of our program design is our interconnectivity, which also helps us address the multiple needs of our learners and meet demand in an efficient manner. For example, job readiness, computer instruction and financial literacy are embedded in all of our ESOL classes, from “absolute beginner” to transitions to college and careers. Learners can acquire the critical skills to succeed in today’s economy while building English proficiency. They can also transition from ESOL to one of our job training programs once their English improves. In addition, we have onsite childcare so parents and children can learn together in one building. PBN: The Rhode Island Foundation just awarded the center a $47,265 grant that will help expand employment counseling services and establish a hybrid e-learning resource for unemployed and underemployed adult learners. Tells us about this e-learning resource. CARROLL: We needed to expand our job counseling services to reach our highly motivated evening ESOL learners, who usually are attending classes after work so they can improve their English to get better jobs. With more intensive job counseling services, these learners can fine-tune their goals and get the necessary support to start on a career pathway. The hybrid e-learning platform we are developing offers individualized curriculum options to augment classroom learning. Participants take an assessment that identifies competencies that need to be developed, and an online learning plan is developed to meet their specific learning needs. A classroom facilitator is assigned to guide each student and offer assistance, but much of the work can be completed at home to intensify and accelerate learning gains. As the program takes off, we are confident that we will be able to serve more students in a more efficient way and, as a result, amplify our impact on the community by creating a more educated community that is prepared to meet the demands of today’s workforce. We are so appreciative of the support that the Rhode Island Foundation has provided us over the years. PBN: What percentage of your clients are immigrants and what unique services do they require? CARROLL: Approximately 75 percent to 80 percent of our clients are immigrants; the others are individuals who were born and raised in the U.S. and want to develop employment skills or get their high school diploma. Last year, we convened a series of focus groups, and the overwhelming feedback was that the Genesis Center creates a welcoming environment for its learners. So, whether someone is an immigrant or not, we want everyone to feel that they are in a comfortable and safe environment that will promote learning and build confidence to attain their goals. While we have nearly 40 countries represented in our student body and we embrace that diversity, the fact that someone is an “immigrant” is tangential to the services they receive that are always client-centered, outcomes-focused and mission-driven. Before I moved into administration, I was an ESOL teacher for adult learners, and I found that when students are engaged and relaxed, they learn better. That is the culture I still try to foster as I lead the center. Having said this, there are pragmatic concerns when serving a large foreign-born population that covers a broad spectrum from new immigrants and refugees to immigrants who have been in the U.S. for many years. Wrap-around support services help students manage a myriad of issues, such as childcare, transportation, access to medical care, etc., that could hinder their progress. Furthermore, our teachers need to be flexible, as a one-size-fits-all curriculum will not work. Many times an ESOL class may have a college graduate sitting next to a person who didn’t complete elementary school in his or her own country. That requires some savvy lesson planning, and our teachers are trained to adapt their materials and instruction to meet this range of learning abilities. Our staff recognizes that our clients, while they may lack English proficiency, are highly motivated individuals who are seeking the skills to create better lives for themselves and their families. The research we did last year confirmed this and led us to create our new tagline, “Genesis Center: where the will to achieve meets the skill to succeed.” We aim to provide the tools to our learners and families to realize their goals. PBN: The center serves more than 650 people a year in adult education and workforce development. Is this number growing and, if so, what other funding sources are you developing to help provide services? CARROLL: It is growing, but we are limited by the space available in our facility and adult education funding, which has decreased in recent years. We hope that our partnerships with local schools, employers and our distance learning program will allow us to continue serving more participants. We were very happy to receive a Governor’s Workforce Board Innovation grant this year that, in partnership with CharterCARE Health Partners and the city of Providence, has allowed us to develop a series of workforce trainings specifically tailored to CharterCARE. This type of partnership is what we and other education providers in the state need to be doing – providing contextualized training that builds basic literacy skills while simultaneously putting people on a career pathway. It’s not simply about getting jobs anymore; people need opportunities to build careers that will promote family economic stability. We are confident that as more funders see the great results we’re getting, they’ll be more likely to invest in our programs. In fact, we saw the center’s highest job placement rate ever, 163 jobs in the 2014-15 program year. PBN: As the leader of the center, what is your long-term vision for growth? CARROLL: If we want to secure the resources to grow, we must promote awareness of our programs and our results. A visitor to the center recently called us a “hidden gem,” and I think it’s time we no longer fly under the radar. I hope to get more exposure so we can attract more investment in our programs, which is really an investment in all of Rhode Island. The majority of our students come to Genesis to get a job, get a better job or build a career. To do that to the best of our ability, one of the critical pieces is to get employers on board. I want employers to recognize the hugely valuable resource available to them through adult education providers, and to get to a place where we can work directly with employers to develop and implement programs that meet their hiring needs. We have eager future employees ready to train – and we can provide tailor-made, contextualized, high-quality trainings at a low cost. It’s a win for our learners and the employers. We are also working to develop closer ties with higher education to provide seamless transitions to college credit-bearing classes so our students can acquire the necessary credentials to continue on their career pathways. I believe that a consolidated effort among community-based training providers, employers and higher education institutions can create a more workable world for all Rhode Islanders. Posted on November 16, 2015 by Shannon Carroll. Click here to Like Bottaro Law Firm and support Genesis Center. We are extremely excited and proud to kick off our charity partnership program this month with theGenesis Center, a wonderful organization that serves over 600 individuals in adult education, workforce development, and over 100 children in its childcare program each year. For every NEW page like the Bottaro Law Firm receives this month, we will donate this non-profit $1, so be sure to share this with friends and family to help raise awareness and donations! Thank you. Genesis Center is proud to announce that our president, Shannon Carroll, is one of this year's recipients of the College of the Holy Cross Sanctae Crucis award! Read more here. Posted on September 23, 2015 by Tyla Pimentel. Posted on August 31, 2015 by Shannon Carroll. Genesis is now participating in Amazon Smile. When you shop at Amazon, just go to smile.amazon.com and designate Genesis Center as your favorite charity. With each purchase, Genesis will get a small donation. That simple. So SMILE. Posted on May 29, 2015 by Shannon Carroll. Come see Chef Anthony of Table and Chef Joshua of Genesis Center duke it out at the grand opening of the Armory Farmers Market in the third annual Seafood Throwdown! On Thursday, May 28 at 4 pm at Armory Park, the two chefs will face off by preparing a delicious dish using only a "surprise" seafood ingredient and a few items purchased at the market. The event is co-sponsored between Farm Fresh RI and Northwest Atlantic Marine Alliance. Event hosts are Robin Dionne of the arcade providence and John Taraborelli of... just about everything. Culinary Creations will be judged by Peter Gobin of Mijos Tacos, two time Seafood Throwdown champion, Jim Nellis of RI FOOD FIGHTS, Julius Kolawole of African Alliance of Rhode Island and Jen McCann of Rhode Island Sea Grant. Come on out and learn about local seafood, buy some delicious veggies, and find out who this year's champion will be! Posted on May 20, 2015 by Tyla Pimentel. Posted on April 20, 2015 by Shannon Carroll. Posted on April 8, 2015 by Shannon Carroll. Posted on March 24, 2015 by Shannon Carroll. 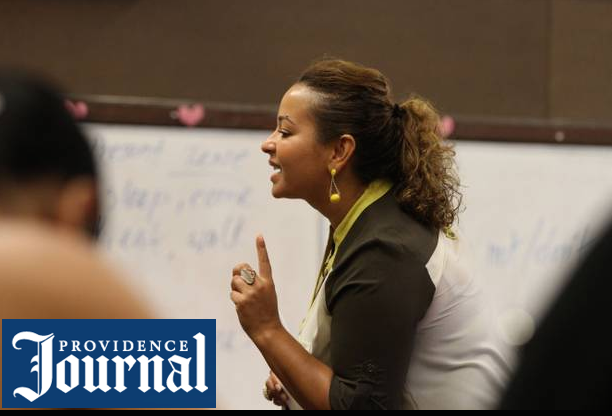 Malaika Alexander, 33, the daughter of Peace Corps volunteers, teaches English at the Genesis Center in Providence. PROVIDENCE, R.I. — Her parents met while serving in the Peace Corps in Sierra Leone. She grew up in various countries, but not the United States until she was 15. As a little girl, she dreamed of serving in the Peace Corps, too, and she did, in Jamaica. She works at the Genesis Center, a nonprofit that provides education, job training and support to, as its mission statement says, “people of diverse cultures so that they may achieve economic independence and participate fully in society.” The center is at 620 Potters Ave. in the West End. In her class, which is Level II ESOL, she might have “a Buddhist monk sitting next to someone who just came from a refugee camp in Africa sitting next to a woman from Poland. “I’ve had up to 15 different nationalities in the class,” she said. She teaches in English. “Magic happens in the classroom. More than 600 adults a year learn at the Genesis Center, which cares for up to 100 children so their parents can attend classes. More than 25 countries and 10 language groups are represented, the center says on its website. Clients learn English and life skills and get job training so they can support themselves and their families. In July, the center was chosen by Vice President Joe Biden as one of the nation’s 30 model programs for the National Skills Coalition, which organizes and advocates to raise job skills. Malaika Alexander’s parents, Judy and James Alexander, met when both were serving in the West African nation of Sierra Leone in the late 1960s. He was from Alabama and she from Ohio, and they got married in New York. They rejoined the Peace Corps and served in Liberia before returning to Sierra Leone, where Malaika was born. Malaika means angel in Swahili, Judy said. Then the family moved to Sri Lanka in South Asia, where Malaika remembers a birthday when a neighbor’s baby elephant gave rides. They moved back to Africa, where they lived in Sudan and Zimbabwe. In Zimbabwe, she went to Hippo Valley Elementary, she said. It’s exciting, she said, to watch a student become a citizen. Posted on September 2, 2014 by John Lloyd. One of our very own just opened Blend Cafe featuring modern Latin American Cuisine. The restaurant is located at 745 Reservoir Avenue in Cranston, RI. Take your taste buds on a trip to Blend Cafe for original Latin cuisine. Posted on August 19, 2014 by John Lloyd. Genesis chosen by Vice President Biden as a "model program." Donald S. Keel, President and CEO of The Genesis Center is pleased to announce today that The Genesis Center has been chosen today by Vice President Joseph Biden for an honor bestowed upon only 30 nonprofit organizations around the country as part of the National Skills Coalition. The Genesis Center was selected as a "model program." At noon, President Obama signed the Workforce Innovation and Opportunity Act (WIOA) bill and Vice President Biden released the review of federal workforce programs that exemplify success. Since January, the President has been shining a brighter spotlight on job-driven training as an essential pillar of our nation's economic strategy. Today, the Administration has called for job-driven training across federal agencies and has profiled successful local efforts that he wants to see replicated throughout the country. watch the announcement, read the report and then scroll down to the map to find us. The Genesis Center is honored to be one of the local efforts featured as a national model, " where the will to achieve meets the skill to succeed", The Genesis Center has been educating and enabling people from around the globe, not only how to speak English, but also how to become computer literate, build financial literacy, and make it in the American workplace. Posted on August 7, 2014 by John Lloyd.